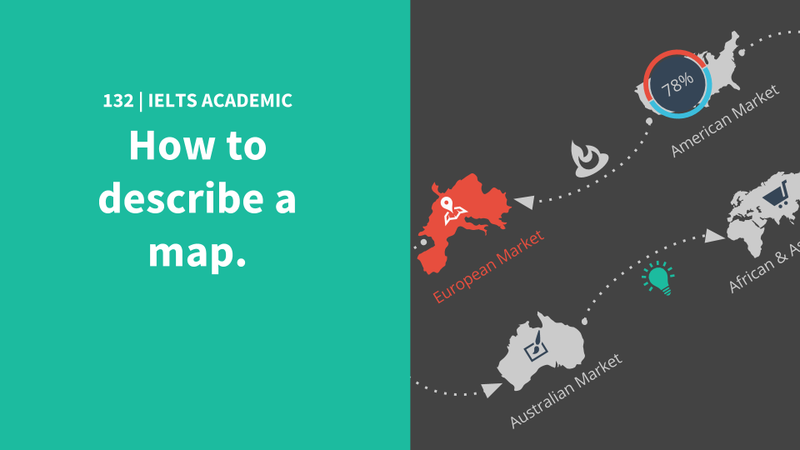 In Task 1 of the Academic Writing component of the IELTS exam, you may be asked to describe a map or plan. The diagram will be of a building, street, village, city or town plan that may ask you to contrast the past and present, or the present and future. There will also be a key that explains different locations on the map or a reference to roads and routes. You are expected to write a 150-word description of the information on the map, which will probably include buildings, routes or proposed changes for the future. Your writing will be scored on four criteria: task achievement, coherence, lexical resources and grammatical accuracy. Let’s review techniques to achieve a good score in all four areas. Organise your thoughts before starting. This is critically important. Plan what you will include for each paragraph. A good technique is to explain the area as if you were walking in. So if you had a map of a house, you would start with the doorway or entrance hall. Alternatively, if the map is larger you can start from right to left. Just make sure it’s logical i.e don’t jump from right to left to centre. TIP: While planning, look for opportunities to group the information, for example; both maps may have an area that is unchanged between the time dates. This can be written up as: Over the fifty year period both maps have maintained a distinct recreational area despite the extensive construction in the surrounding areas. Be sure to write at least 150 words that describe all information illustrated in the map or plan. Take about three minutes to understand the map, identify changes and circle the key points. Summarise the main changes or information in the introduction and give more detail in the main part of your text. Give a short summary to sum up the impact of these changes on the town or area. The format of your text should be written in three to four paragraphs: an introduction, main paragraph(s) and conclusion. The use of connectors, such as First of all, In addition to and To summarise, are important to maintain coherence and a logical flow of ideas in your work. Other useful structures would be; opposite, in front of, on the right, to the north, to the south, etc. Maintain separate paragraphs to distinguish changes or comparisons. For example, use your second paragraph to give details of the first map and write about the next map in your third paragraph. Be sure not to repeat the vocabulary shown on the map, but use your own words for the description. Let’s consider useful vocabulary to describe a map or plan. This map illustrates plans to change the green area into a playground for children. Of course, try to use synonyms to add variety to your use of language. Synonyms of illustrate are highlight, indicate or demonstrate. = This map highlights a project to transform the green park into a play area for children. There is a large residential area between the small lake and the park. A road runs alongside the border of the park. This plan proposes to build a playground in the south-west part of the park. The airport is currently located north-east of the town.It will be moved to the west of the park where there is more space. A lot of other useful vocabulary for maps or plans includes town centre, residential area, roads, routes, railway station and traffic-free zone. Where possible, use synonyms to avoid repetition. TIP: Comparisons, and superlatives are also valuable points winners! The park is located west of the village. The playground will be built in the south-west part of the park. A flower garden will be created east of the playground. Currently, there is a traffic-free zone in the center of the park. This zone will be expanded to the west area of the park. In 2014, there was a train station located in the north-east of the region. Currently, this station is now based in south of the village. A new hospital has been constructed in the east of the village. There have been two new roads built around the border of the town. To the south of the river, a new hotel has been constructed. Greystones, which has a population of 50,000, is situated south of Dublin on the seaside.